It’s the annual performance test that makes the Stig wish for a transfer! Hot hatches, supercars, fast saloons and more, the year’s 30 best performance cars do battle in the new, special issue of CAR magazine out now. Can a Mitsubishi Evo beat a Porsche Panamera Turbo around our track? Is it the Ferrari, Aston Martin or Lamborghini that’s our favourite supercar? And would we pick a Golf GTI or Ford’s crazy Focus RS after blasting across the North Yorkshire moors? 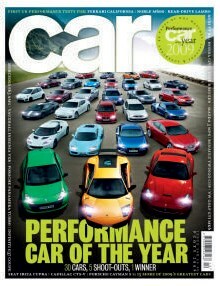 Find out in the new Performance Car of the Year 2009 issue of CAR magazine, on sale in all good newsagents. Now vote for YOUR favourite performance car in our poll below and enjoy some behind-the-scenes photos, plus videos of all 30 cars racing against the clock at the Rockingham circuit. >> Subscribe to CAR Magazine from just £19.50 and get four of the greatest car movies of all time completely free!